American wrestler A.J. Styles is one of the best wrestlers in present times, who is presently signed to WWE, where he performs on the SmackDown brand. Beginning his wrestling career in 1998, Styles has been associated with various wrestling brands like World Championship Wrestling (WCW), Total Nonstop Action Wrestling (TNA) and Ring of Honor (ROH) before landing on World Wrestling Entertainment (WWE). 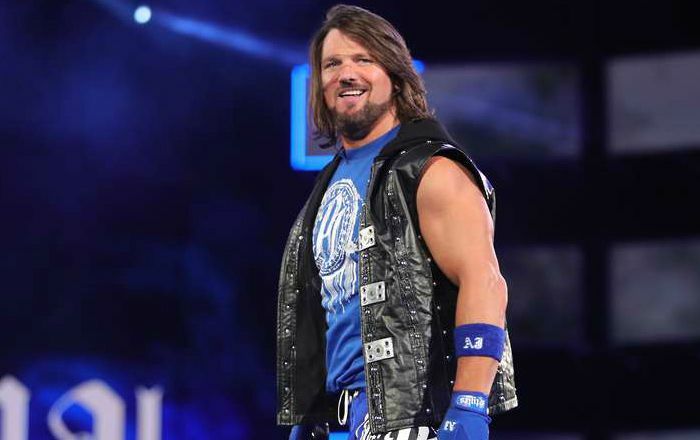 He has won several championship titles during his tenure and after winning the WWE championship in 2016, he became one of the three wrestlers to hold a WWE Championship and NWA World Heavyweight Championship at the same time in history. A.J. Styles was born on 2 June 1977, in Camp Lejeune, North Carolina, United States. He’s currently 41 years old. Styles attended Johnson High School in Gainesville, Georgia, graduating in the class of 1996. He then got admission at the Anderson University in Anderson, South Carolina under a partial wrestling scholarship, but dropped out to focus on his professional wrestling career. He later joined the professional wrestling school to hone is wrestling skills. Allen Jones married Wendy Jones, a school teacher, in 2001 after dating for about six years.They have four children, three sons named, Ajay Covell Jones (b. May 3, 2005), Avery Jones (b. February 14, 2007), and Albey Jones (b. September 15, 2009), and a daughter, Anney Jones (b. October 8, 2014). He has since participated in various wrestling tournaments as well as wrestling brands. He made his WWE debut in the 2016 Royal Rumble pay-per-view during the eponymous match for the WWE World Heavyweight Championship. A.J. Styles appeared as himself in a TV movie Genesis in 2009. Styles has an estimated net worth of $6 million US dollars. With an annual earnings of $2.4 million in 2017, he joined the list of highest paid wrestlers in the world. He makes more than $500 thousand from WWE and a busiest star to have played a dozen pay-per-vie events in 2017. Walking that red carpet at EA Super Bowl party. Born in poverty, Styles didn’t have a nice upbringing which he descries his childhood as ‘worse than hell’. He was brought by his abusive, alcoholic father. During his days at the professional wrestling school, he worked as an ambulance driver and mowing lawns to make his ends meet. Styles was trained by professional wrestler Rick Michaels who is 4 years his senior. He earned his first recognition in the form of WWA International Cruiserweight Championship, his first ever title, defeating Jerry Lynn on Australian promotion World Wrestling All-Stars (WWA) in February 2002. He became widely known for his tenure in TNA from 2002–2013, where he was dubbed “Mr. TNA”. While in TNA, Styles held the NWA World Heavyweight Championship three times and the TNA World Heavyweight Championship twice. Styles is the first professional wrestler ever to complete the TNA Triple Crown (five times) and the TNA Grand Slam (two times). In 2010, Styles became the first ever TNA-contracted wrestler to be ranked number one on the annual Pro Wrestling Illustrated (PWI) PWI 500 list. In 2011, Styles was featured in the music video for country singer Sarah Darling’s song “Something to Do with Your Hands”. Styles was inducted into the WON Hall of Fame in 2017. He is a big fan of Christian hip hop music, and boasts that he can “school almost any rapper” on the genre’s history.